When French chemist Louis Nicolas Vauquelin first received a sample of Siberian red lead in 1797, the mineral--known today as crocoite--had been in use as a pigment for over three decades, but its chemical composition had remained a subject of dispute. Vauquelin resolved the debate when he was able to isolate a new metallic element, chromium, from the sample, a discovery he reported in the scientific literature the following year. The process he used to isolate pure chromium metal had produced a variety of vibrantly colored solutions and compounds, and it was due to this that Vauquelin’s colleagues had suggested the element be named from chroma, Greek for “color”. Vauquelin went on to detect traces of chromium in precious gems such as rubies and emeralds, and to hypothesize correctly that chromium gave these gems their brilliant colors. The earliest uses of chromium exploited its compounds. Lead chromate, the main compound in crocoite, was used to produce a pigment called “chrome yellow”, a color well known due to its widespread use for school buses in the United States and postal vehicles in some European countries. Use of actual lead chromate has declined significantly due to toxicity concerns, but the color is still used, replicated using less toxic alternatives. Viridian, a green pigment produced from chromium(III) oxide, is not toxic and is still used widely in ceramics and glassware. Other chromium(III) compounds have been used in tanning since the early 19th century, as a reaction between chromium and the collagen fibers stabilizes leather. Chromium compounds continue to find applications in industry. A number of chemical processes use chromium-containing catalysts including the production of polyethylene, the most common form of plastic. Chromium salts are used in wood preservatives, and chromium provides color to synthetic rubies and emeralds. The first laser was built using a synthetic ruby. Both chromite and chromium(III) oxide can withstand high temperatures, and are frequently used as refractory materials such as brick molds and foundry sands. Chromium (IV) oxide is magnetic, and is used to manufacture the magnetic tape used in audio cassettes. The vast majority of chromium is used in metalworking , either as a component of alloys or in various types of surface treatments. Chromium strengthens and imparts corrosion resistance to alloys. High-speed tool steels include small percentages of chromium for added strength, while higher percentages of chromium produce stainless steel. Additionally, nickel-based superalloys derive increased strength from the inclusion of chromium; these alloys are frequently found in devices such as jet engines that require materials to be stable and strong at very high temperatures. Chromium can be applied to metal surfaces via electroplating, and such surface treatments can provide wear resistance and, because chromium can be polished to an appealing silvery sheen, decoration. Additionally, chromic acid is used in chromate conversion coating, which produces a distinctive yellow finish on metal surfaces that may be used for corrosion inhibition or as a primer for further coatings. Anodization of aluminum is yet another finishing process that utilizes chromic acid, though it does not produce a chromium-containing coating. Unfortunately, chromium(VI), known commonly as hexavalent chromium, is now known to be a potent carcinogen. Hexavalent chromium ions wreak havoc in the body because they are strong oxidizing agents that are easily transported into cells, where they cause significant damage to DNA and proteins. Many industrial processes that involve chromium, including chrome plating and chromium conversion coating, usually use hexavalent forms of chromium, and therefore the contamination of groundwater with hexavalent chromium from industrial waste is a major environmental problem. Alternative processes using trivalent chromium, which does not present the same toxicity concerns, are under investigation, as use and disposal of hexavalent chromium is now highly regulated. Chromium is mined as chromite, an iron chromium oxide mineral. This ore can be processed either to pure chromium metal or to ferrochrome, an iron-chrome alloy used primarily in the production of stainless steel. Chromium can also be recovered from scrap, and recycled metal accounts for almost a third of chromium used annually. Chromium's hardness and high resistance to corrosion make it ideal for alloying and steel producing applications. Steel can be made highly resistant to corrosion and discoloration by the addition of chromium, forming stainless steel. When chromium is added to glass or ceramic glazes, it produces a brilliant green color. Chromium is available as metal and compounds with purities from 99% to 99.999% (ACS grade to ultra-high purity). Elemental or metallic forms include pellets, rod, wire and granules for evaporation source material purposes. Chromium nanoparticles and nanopowders are also available. Chromium oxides are available in powder and dense pellet form for such uses as optical coating and thin film applications. Oxides tend to be insoluble. Chromium fluoride is another insoluble form for uses in which oxygen is undesirable such as metallurgy, chemical and physical vapor deposition and in some optical coatings. Chromium is also available in soluble forms including chlorides, nitrates and acetates. These compounds can be manufactured as solutions at specified stoichiometries. Chromium is a Block D, Group 6, Period 4 element. The number of electrons in each of Chromium's shells is 2, 8, 13, 1 and its electron configuration is [Ar] 3d5 4s1. 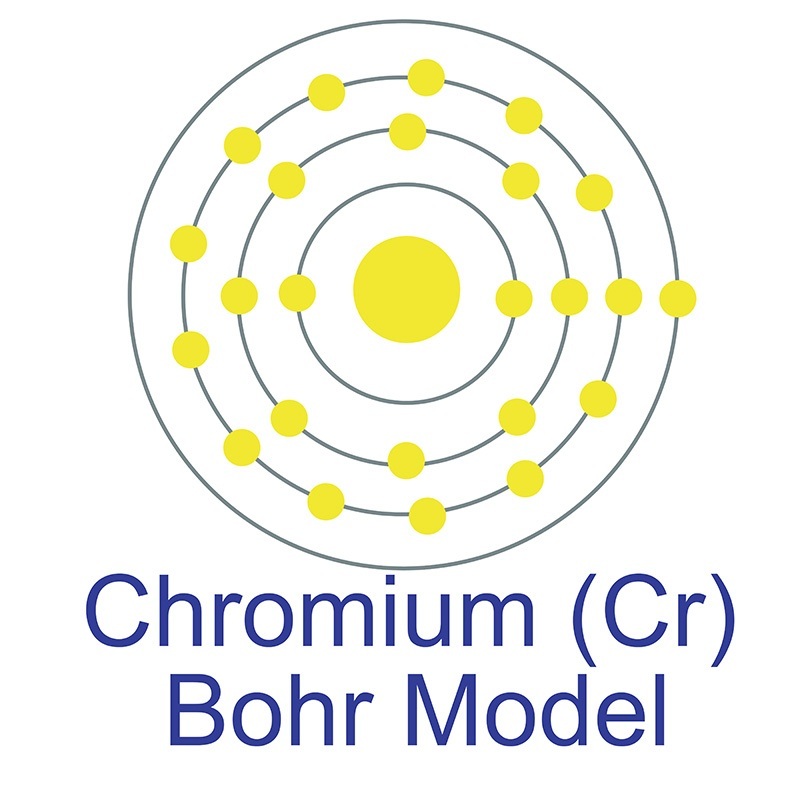 The chromium atom has a radius of 128.pm and its Van der Waals radius is 200.pm. In its elemental form, CAS 7440-47-3, chromium has a lustrous steel-gray appearance. Chromium is the hardest metal element in the periodic table. The most common source of chromium is chromite ore (FeCr2O4). Chromium was first discovered by Louis Nicolas Vauquelin in 1797. Due to its various colorful compounds, chromium was named after the Greek word 'chroma' meaning color. Although chromium metal is an essential trace element, hexavalent chromium (Cr(VI)) is especially toxic and carcinogenic to humans. Safety data for Chromium and its compounds can vary widely depending on the form. For potential hazard information, toxicity, and road, sea and air transportation limitations, such as DOT Hazard Class, DOT Number, EU Number, NFPA Health rating and RTECS Class, please see the specific material or compound referenced in the Products tab. The below information applies to elemental (metallic) Chromium. After swallowing If symptoms persist consult doctor. Methods and material for containment and cleaning up: Pick up mechanically. Naturally occurring chromium (Cr) has four stable isotopes; 50Cr, 52Cr, 53Cr, and 54Cr. 52Cr is the most abundant (83.79%). 50Cr decays by ß+ß+ to 50Ti with a half-life of (more than) 1.8x1017 years.